Our wooden «Evo» surfboard is orientated towards advanced surfers and a perfect «step up» board. It can be surfed in very different conditions from knee high to head high waves. It is also suitable for bigger surfers, for whom a classic short board is just too small. The nose is a mixture of a short board and a Retro fish. It lets you paddle easily and catch waves early, but is still «Duck Dive- able». The «squash tail» is shaped for medium sized waves and works perfect in knee to head high waves. 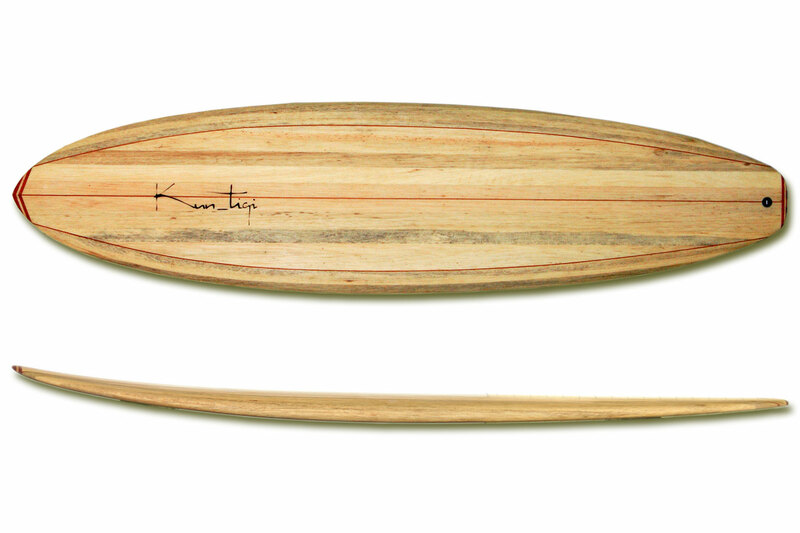 Three hardwood stringers give this wooden surfboard extraordinary stability. Nose and tail are also reinforced with hardwood. The ideal wave height is between 0.6 and 2 metres. The Balsa «Evo» comes with a bio plastic vented leash plug and three Future fin boxes. The right Future Fins for you can be ordered on demand with the board.